Warm Up With Metal Stools. Really? Really! Metal stools are just as comfortable as any other stool. Lots of people think that metal bar stools feel cold compared to wooden stools, but that’s not the case. If you keep your house properly heated – at room temperature through the winter – the metal of your stools will equalize to the same temperature as the room. This means that the stools won’t feel cold when you sit down. Just the same, if you keep your house cold, wooden stools will feel cold too. And if you go on vacation and turn your heat down to 50 – yes, the stools will be cold when you get back. Metal stools have comfy, padded seats. Most metal stools don’t have metal seats – they have padded seats with a variety of comfortable cushions. The Bailey stool from Callee has a round, padded seat. You can customize it with your choice of fabric, including woven polyester (strong and easy to clean! ), vinyl, microfiber, and cotton-blend. Or consider the Claremont stool from Callee. It has an oversize padded seat that widens to a flat front. 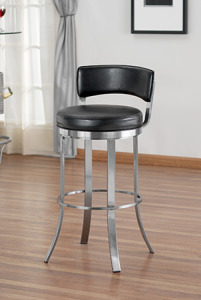 This extra-comfy stool looks great with bonded leather, faux-leather, or vinyl. Padded backs offer extra warmth. 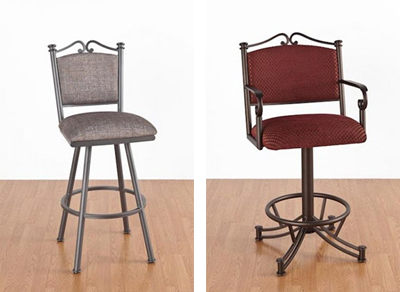 Metal stools have all types of backs, including metal, wood and padded. Yes, a metal back will feel the coolest. We recommend these to anyone lucky enough to live in a place that’s warm and sunny all year round! The Bailey stool shown above has an upholstered half-back. The Sonoma stool and its swivel cousin the Seattle both have full, padded backs. Of course, you can customize the fabrics on all of these. 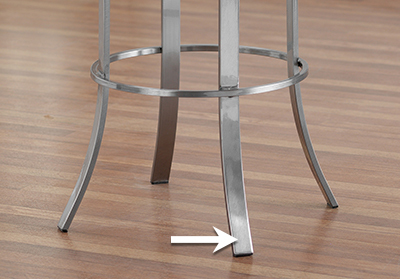 Powder-coated metal frames help keep your stools warm to the touch. Most metal stools have a powder-coated finish. During the powder coating process, the metal frame is covered in a polymer powder – it’s like dry paint – and baked in an oven. 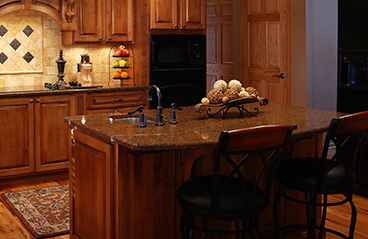 This finish can act like an insulator and keep your metal stools much warmer to the touch compared to bare metal. Some powder coated finishes have a slight texture to them. While we don’t know the exact science behind it, this finish seems to feel warmer than perfectly smooth metal. Maybe the air gets trapped in those microscopic dips and warms up better. Have any questions about metal stools? Call us at 610-737-5693, send us a note, or post your question on our Facebook page. We’re happy to help you find the perfect stools for your home – metal or wood!